And the winner is…. Option A! The poll received 50 responses, with 30 individuals preferring Option A. This preference was consistent regardless of age and gender. Poll participants who favored Option A noted that it spoke more to their specific needs and stated how the product could help them. One respondent wrote, “This phrase makes more sense and implies that this app/site would make your job easier.” The wording in Option A painted a clear picture for panelists, emphasizing the key benefit of the product: simplifying the process of starting a one-person business. The use of the word simple appealed to many respondents because it showed them the biggest benefit of the product. One person noted, “People are always looking for an easier way to do things. Whether it’s apps on their tablets or phones or other shortcuts they can take in life. Telling them the site makes things simple will draw more people to it… this tells them it will be easier for them.” It’s important to note that the headline focused less on software features and more on the benefits of the software for the user. The results from this poll also show how important it is to make sure headline words are clear for the target audience. For example, respondents found that the word empowering in Option B was too vague, whereas the word simple gave them a clear picture of what the services could do for them. Several respondents also noted that “empowering” is an overused phrase that sound too much like jargon. When creating your own headline, it’s important to ensure that you have selected the right word for your target audience. That is why it is important to split test different options prior to publishing. As you craft your own headline, take time to brainstorm keywords that represent what the product could do for your audience. One effective copywriting strategy is to think of the problems your audience is facing. What is frustrating your target audience? Use words that speak to that frustration and show how your product is a solution. You can use a thesaurus to help you brainstorm possible words. Once you have your headline options, you can conduct a split test on them to see which one works best. 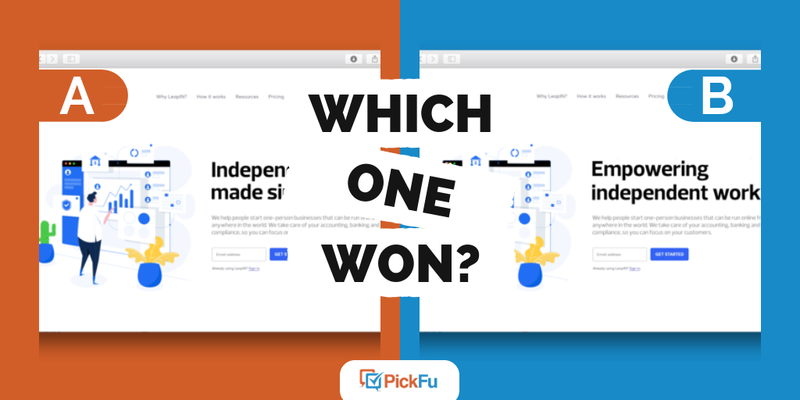 When you create a PickFu poll, you can test different headline possibilities on a specific target audience. You’ll receive feedback on your headline options within minutes.